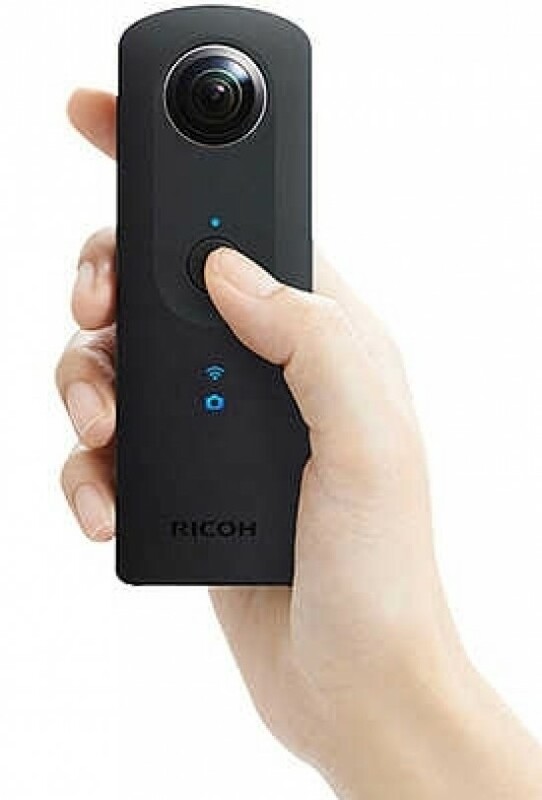 The Theta S is one of two cameras recently released by Ricoh that records wraparound 360 x 180-degree spherical panoramas with just a single click. We've already reviewed the Theta S' sister camera - the Theta m15 - and found it to offer excellent usability but mediocre image quality. The Theta S promises an improvement in that department, with its images recorded at 14.4MP rather than the m15's 6.4MP. Extra features include spherical video recording, an interval timer for creating time-lapse sequences, plus comprehensive remote camera control via built-in Wi-Fi. 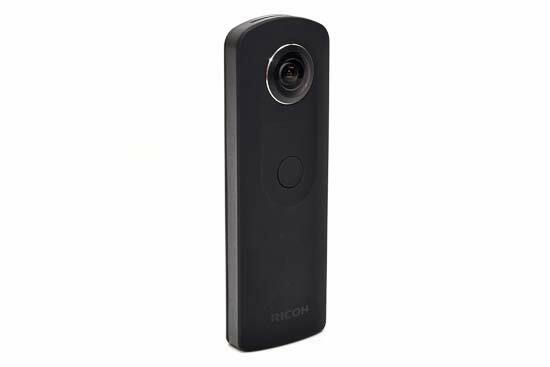 All this innovation doesn't come cheap though, as the Ricoh Theta S will set you back around £299/£347. 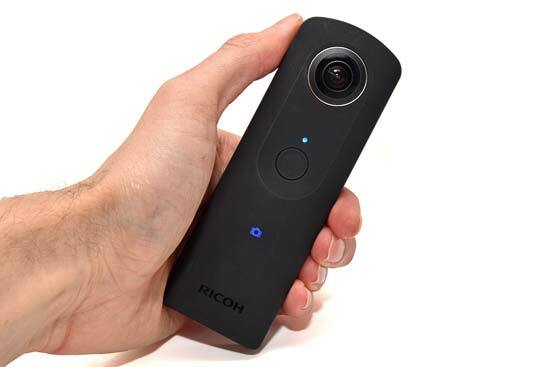 The key concept of the Ricoh Theta S is to instantly capture 360 x 180-degree spherical panoramas. That's the fancy way of describing the kind of wraparound view you get in Google Street View. But unless you have access to Google's advanced camera equipment, capturing these virtual reality images has traditionally required snapping your surroundings across multiple adjacent images with the aid of a specialist tripod head and stitching them together with specialist software. It's not a quick process, hence the Theta's appeal. Given how much time and precision is required to conventionally capture 360 x 180-degree spherical panoramas, it's surprising how simple the Theta S is to operate as you don't have to worry about focussing or framing. The camera uses two back-to-back image sensors, each fronted by a fisheye lens facing in opposite directions. These each capture a 180 x 180-degree field of view, leaving the Theta S to join the two images together to form a complete spherical panorama. Simply press the shutter button and that's it; the Theta S captures a snapshot of everything around it. The image you're left with is somewhat bizarre though, displaying a similar effect to a world map, whereby the top and bottom of the image are extremely stretched in order for the spherical photograph to form a normal two-dimensional rectangular image. For this reason the Theta S doesn't feature any LCD display, instead relying on built-in Wi-Fi and a companion mobile app with its own interactive panorama viewer. This projects the image in its proper spherical shape so you can then swipe your smartphone or tablet screen and scroll around your scene, just as in Street View. Not only can the Theta S record spherical images, it'll also pull the same trick with video. You'll still need Ricoh's smartphone app or its Spherical Viewer software for Windows or Mac to view the videos spherically though. Use a conventional video player and you'll be met with a black Full HD video frame containing two circular fisheye recordings next to each other. Activating video mode on the Theta S is much easier than with the Theta m15. You simply press the dedicated video mode button on the edge of the device and an illuminated icon below the shutter button displays the active shooting mode. Above the video selection button is the Wi-Fi control. Unlike many compact cameras where Wi-Fi is only moderately useful, the Theta S makes it almost essential. You'll need it for live image preview and image playback, as well as for changing camera settings. Your options here are very limited, but one thing you may want to adjust is the camera shutter volume. This can be set to three volumes, or turned off, which can be useful as the Theta isn't for the self-conscious. For starters it doesn't really resemble a typical camera and you don't use it like one, which combined with its distinctive sci-fi shutter bleep tends to attract attention from anyone in your immediate vicinity. A less conspicuous option would have been to include a vibration setting instead, but sadly this isn't available. The smartphone app also lets you choose between two image sizes; the full 14.4MP 5376x2688 resolution, or there's a 2MP 2048x1024 option, which is nowhere near enough for acceptable image quality and is best avoided. You're unlikely to need this option to preserve memory space though, as the Theta S has 8GB of built-in memory (compared to 4GB in the Theta m15), which given that each 14.4MP JPEG consumes no more than 4MB means you'll have space for at least 1600 shots or over an hour's worth of video. It also makes the Theta S' lack of a MicroSD slot less of an issue than it would be with a more storage-hungry device like a smartphone. Back to the app and we find it also contains some extra shooting features. There's an interval mode that lets you set the camera to record time-lapse sequences, and you can use your smart device to take live control of the Theta S and shoot regular images and video remotely with a live image preview. Shooting remotely also opens up a range of advanced shooting options, like shutter speed control (which can be set to record long exposures up to 60 seconds long), ISO and white balance settings, plus there's an exposure compensation slider. The ability to mount the Theta S to a tripod and operate it from a distance also means you can hide out of sight of its all-seeing eyes. When you shoot hand-held, there's no avoiding you being visible in the final image. The most you can do to minimise your presence is hold the camera as far away as possible, or above your head, although this technique will attract even more stares of confusion. Fortunately, where the Theta m15 is only available in eye-catching blue, yellow, pink and white finishes, you can have the Theta S in any colour you like, as long as it's black. The external coating is a matt finish that feels a little like suede and is surprisingly grippy. The physical shape of the Theta S is almost identical to the m15, though at 44mm wide, 130mm long and 22.9mm thick, its 2mm wider, 1mm longer and a hair's width thicker than the Theta m15. It's also 30g heavier at 125g, though you will be able to capture 260 shots from its built-in (and inaccessible) Li-ion battery, where the m15 can only manage 200. However, even the Theta S' battery life isn't exactly impressive when you remember it doesn't have a screen or flash to sap power. 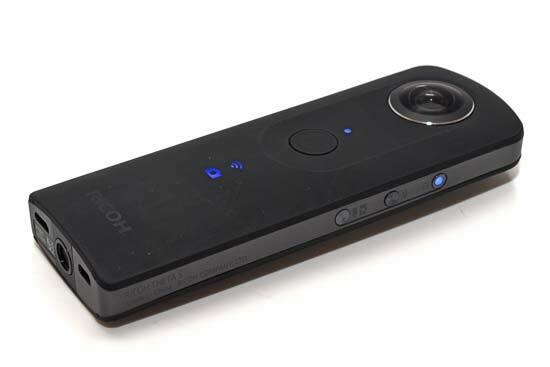 In addition to the shutter release and edge-mounted power, Wi-Fi and video mode buttons, the Theta S' casing features several LED indicator lights above and below the shutter release button, including the active shooting mode lights, a Wi-Fi indicator, and a memory status lamp that lights up when you're approaching maximum capacity. On the base of the device is a standard ¼-inch tripod mounting hole flanked by a USB port and an HDMI port that'll let you live stream images and video from the Theta S in real time.